In two short years, Smith Charles has become one of our state's most dominant sprinters (and jumpers). 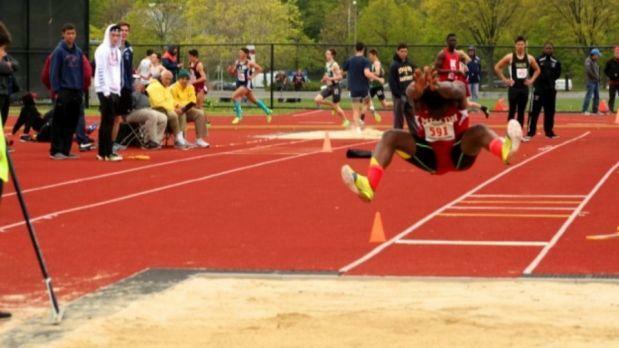 The Milton High junior has already won two state and New England long jump titles, an individual 55-meter crown and was eighth in last year's 60m dash at the New Balance Nationals Indoor Championships. In our latest Q&A, Charles talks about his career, his competition, his unique name (and more!). Trust us, you'll be surprised about his name. 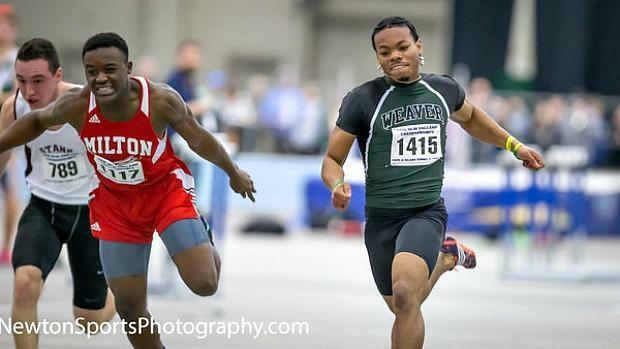 MileSplit MA: You have been one of our most successful sprinters and long jumpers since you were a freshman two years ago with already of handful of individual state titles in both indoor and outdoor track. What do you feel has been the key to your success? What is it that motivates you? Smith Charles: I would say that the key to my success, and my biggest motivation is my fear/hate of losing. I've always hated the feeling, and since freshman year i've pushed myself and given my best effort in hopes that my hard work will pay off. I'm really hoping that track puts me in a better place to do the most I can with my life. 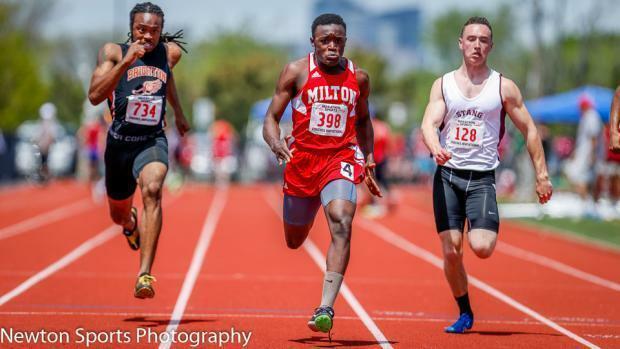 MileSplit MA: During the All State Meet last winter, you captured the 55-meter dash and the long jump and finished fourth overall in the high jump to lift Milton to the indoor state crown. Judging by your past success and the top returnees, it looks like you have a chance to win all three this year. Is that a goal you'll be shooting for? SC: Last year, yes. This season, due to a change in coaching staff, my focusses are primarily the long jump and the dash. I'll be doing the high jump in practice for fun, and I'll probably do it to help my team score more points in tougher meets. MileSplit MA: You have best of 6.40 for the 55m, 6-6 in the high jump and 23-6.75 in the long jump, which you did during the outdoor season. What are your goals in all three events in terms of times and distances? We're guessing breaking 24 feet for the long jump is one. SC: My goals for the regular season are to clock a 6.3 low in the dash, and a high 24 in the long. For postseason, I want to earn All American in the long and dash. MileSplit MA: The 55m and high jump appear to be the most contested events you'll be competing in this season with several athletes capable of pushing you to the limit. Taking a look at the 55m, for example, Ore Ojo (Catholic Memorial) and Davonte Burnett (Hyde Park) are all capable of making things interesting this season. What's your thoughts? SC: I'm very fond of those guys and enjoy their athleticism, as their presence on the track and their abilities are what help me reach my goals. I love competition and without it I'd have no one to push me to be better. I won't be lucky enough to run against Nick Smith this year because he's currently enrolled in his freshman year at BU. MileSplit MA: What are some of the high-level meets you'll be competing in this season, both in-state and beyond the borders? SC: The Rhode Island Classics and the Dartmouth Relays should be toughest for me before I go to States. I'm hoping to get some competition from some of the sprinters in-state as well. MIleSplit MA: What does a typical day of practice look like for Smith Charles? How much do you focus on the jumps? What is your favorite workout on the track? SC: A typical day of practice usually consists of a 30 min warm up, some jump ropes, a core rotation, and then either a speed or endurance workout. I don't get to practice jumping a lot because we don't have a pit in our gym, so to prepare I mostly work on drills and approaches. My favorite workouts are short, fast, sprints because I can develop my mindset for the big races. My teammates are right behind me pushing me to be faster. MileSplit MA: Amazingly, you still have one more year left of track after the 2018 season. What would you deem as a successful way to end your career at Milton? SC: By the end of my high school career, I hope to place first in either the dash or the long jump at Nationals. That's been the goal since freshman year. I also hope to help Milton to a State Title that they haven't had the chance for in a long time. Milesplit MA: The first one I have to ask, you certainly have a unique name with a first name that is one of the most common last names and a last name that is often a first name. How many times a week, on average, does someone confuse your name? SC: Believe it or not, Smith is my middle name, which makes it even more confusing for people. Someone will probably get it wrong once or twice in the average week, but when I meet new people the number grows exponentially. People who don't know me call me Charles Smith, assuming it couldn't possibly be Smith Charles. It's even harder for schools and people who try to reach out to me because they don't even know my real name: Joseph Charles. MileSplit MA: What is your favorite Food? TV show? Movie? SC: My favorite food is rice. My favorite TV show is Arrow, and my favorite movie is The Lion King. MIleSplit MA: Who is your sports idol? SC: I've always been amazed by Jim Thorpe, because I did a project on him when I was little, and his athleticism inspired me to join track and other sports like football. Now I admire Michael Phelps because of his determination and courage. Being exposed to such high competition at a young age is incredible, and to be able to compete at that level for as long as he has shows his dedication. MIlesplit MA: Any superstitions when it comes to track & field? Is there anything that you have to do prior to each meet? SC: I don't have any superstitions, but I definitely have patterns. During the cadence of the blocks I always do the exact same stretches in the exact same order. Before jumps I do a little back step three times, not really for good luck but because I have been doing it for so long that it's comfortable for me. I tend to switch it up after a bad meet or a bad jump to focus more on doing better. MileSplit MA: Stranded on an island by yourself, what are the three things you would need to maintain your sanity?